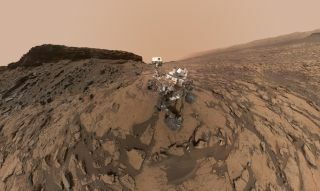 Has NASA's Curiosity rover taken dormant microbes to Mars? That's the question posed by a trio of scientists who are arguing for a shake-up in how we think about planetary protection. The requirement is dictated by the need to ensure the scientific integrity of the discovery of life. How could we be sure we have found life native to another world if we have already contaminated that world with Earthly microbes? There is, however, another aspect to planetary protection that tends to be overlooked, which is that the potential alteration of alien biospheres in the face of invasive terrestrial microbes is also an ethical issue. Currently, the only potentially life-bearing world that could have been contaminated by microbes hitchhiking on a spacecraft is Mars. In 2012, researchers catalogued 298 strains of extreme bacteria that were able to survive the sterilization process in European Space Agency clean rooms, and it is expected that there are dormant terrestrial microbes on Mars today, although it is not suspected that any active contamination has yet taken place. However, that could change if humans land there, or if we send spacecraft to venture into the oceans of the icy moons of the outer solar system. Therefore, it's time to reopen the debate about the risks of "forward contamination" and its ethical implications, said Brent Sherwood and Adrian Ponce of NASA's Jet Propulsion Laboratory (JPL), and Michael Waltemathe of Ruhr-Universität Bochum in Germany. "What motivated us was what I call the pedigree and the provenance of the 1-in-10,000 number,” said Sherwood, who is program manager for solar system science mission formulation at JPL. "By pedigree I mean, where did it come from, and by provenance I mean, how has it been curated since it was written down?" he added. My co-authors and I find it unsatisfying, partly because modern biology is a moving target, and also partly because we are now entering an era where we will be exploring other worlds with vast amounts of water." A future Europa lander would contain a subsystem that would incinerate the inside of the spacecraft once its mission has ended, sterilizing the lander's interior. The current forward contamination requirement has a long history. Its story dates back to 1963, when JPL's Leonard Jaffe first presented the number in a study that was based on two rationales. The first was the likelihood that three-quarters of all life-detecting missions to Mars would fail to return useful data (this was back in the 1960s, when spaceflight was new and mission failures were common), and the second was that the chance of contaminating Mars with robotic spacecraft is much less than if humans landed on the Red Planet. It's not just the danger of foiling our own life-detection experiments that concerns Sherwood and his colleagues. At numerous conferences, and now in a paper published in the journal Space Policy, Sherwood and his colleagues raise the issue of ethics. Saturn's moon Enceladus harbors an ocean that could contain life beneath its icy surface. A future mission to explore this ocean is therefore a serious contamination hazard that could damage any biosphere on Enceladus. In their paper, the scientists cited two examples where scientific endeavors with societal and ethical consequences had risk assessments taken and a decision made as to whether to proceed. The first was the scientific debate over the test of the first thermonuclear bomb in 1952. One concern at the time was that the explosion might ignite a chain reaction in Earth's atmosphere, incinerating it and all life on the planet. Because of the classified nature of nuclear weapons development, these deliberations took place in secret, and the decision was never placed in the wider world's hands. The second example is the switching on of two powerful particle accelerators, the Relativistic Heavy Ion Collider in the USA and the Large Hadron Collider on the France-Switzerland border. In both cases, it was perceived by some that there could be a tiny risk that the particle collisions could produce a black hole that could swallow the Earth. Activists ultimately took the governing bodies of the particle accelerators to court to try and prevent the switch-on of the particle accelerators. In each case, the solution was decided by means that Sherwood would like to avoid — in secret or in a court of law. There is a case to argue that scientific dilemmas with ethical implications should be open for the whole world to debate, just like how discussions over the use of genetically modified foods or artificial intelligence have been placed on the global stage. Furthermore, Sherwood and his co-authors are calling on not just scientists, but also the public and non-technical experts, to discuss the risks of contaminating another world with terrestrial microbes and determine what an acceptable way of managing those risks would be. "The discussion needs to include people who are not technical, it needs to be open and it needs to be ongoing, because there is no such thing as a final answer to any of this,” said Sherwood. He was referring to how our understanding of biology and astrobiology is growing so rapidly that it is beginning to outpace the evolution of our planetary protection policies. Given the length of time it takes to propose, plan and launch a planetary mission, the astrobiological sands could very well have shifted in the decade or so between planning and building a spacecraft, and launching and conducting its mission. A recent report into planetary protection protocols from the National Academies of Science, Engineering and Medicine devoted just a few paragraphs to the discussion of the ethical implications. In the report, the committee of authors recognize that planetary protection and the resulting ethical issues are intertwined, and that their complex nature would require new policies. Despite the National Academies report, Sherwood already has a mechanism in mind for tackling the ethical considerations before they become a more serious concern. He sees two stages, with the first stage being to get the problem out into the open and communicate to the world what can be done, how the risks could be managed, what our limitations are and what the 1-in-10,000 number means. This would help provide context for the global discussion to then move to the second stage, which is deciding from the options available what should be done. Communicating those options correctly is still a problem, said Sherwood, who highlights one particular feature in a concept for a spacecraft that could one day land on the icy wastes of Jupiter's moon Europa, which hosts a global ocean somewhere below the ice. Over eons, Europa is resurfaced and eventually, as part of this resurfacing process that sees the gradual churning of surface ice, any lander would find itself subsumed by the ice and gradually work its way down toward the ocean, where there could potentially be life. The organization that has the ultimate say over space launches is the launching authority in a given country, per the Outer Space Treaty. The launching authority has responsibility for ensuring that the launch is safe, is not carrying any toxic materials that could harm life on Earth in the event of a launch failure, and is not a danger to other satellites and spacecraft already in orbit. In the United States, said Sherwood, the Federal Aviation Administration (FAA) has ultimate control over what launches and what doesn't, but the FAA does not have the personnel to assess the risks for planetary protection.